Ruby grass, Melinus (=Rhynchelytrum) nerviglumis, is a tender perennial from southern Africa hardy only in zones 9-10, but grown as an annual ornamental in temperate areas. The common name refers to the fluffy pink plumes of flower heads produced in the fall. In Africa its common name is bristle-leaved red top. Ruby grass forms a dense, mounded clump of foliage. 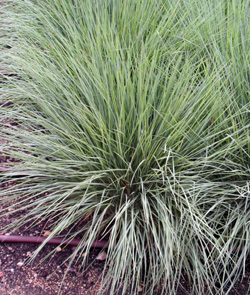 This grass small but showy grass has lush blue-green foliage that turns a purple-red in fall. The plants form dense, mounded clumps 8 to 24 inches tall. The wiry, rolled leaves grow in tufts within the clumps. 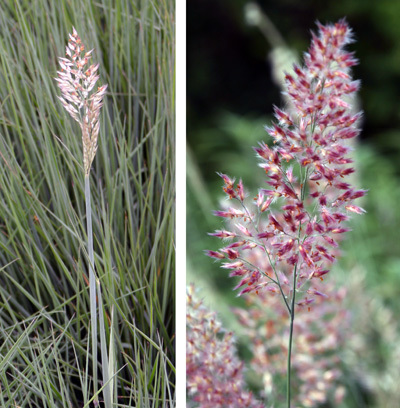 Developing inflorescence (L) and flower panicle (R). 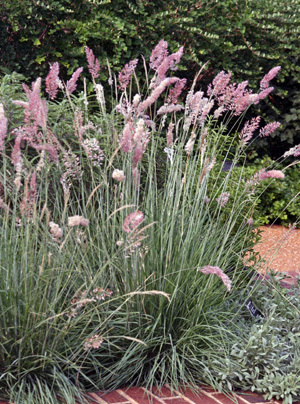 In the summer, soft, fuzzy pink panicles about six inches long are produced on stems up to two feet tall. Peak bloom is late summer to early fall, when the clumps are covered in the pink panicles. The panicles with their glistening silky hairs often hang on the flexible culms for a very graceful effect. The flowers are an iridescent ruby-pink color at first, but as they age the inflorescences become more silvery to white. They are good in both dried and fresh cut flower arrangements. As with most grasses the flowers are wind pollinated, and the small black seed with light, fluffy appendages are scattered by wind. Seed can be collected once the plumes turn brown. Ruby grass a good addition to beds and borders. 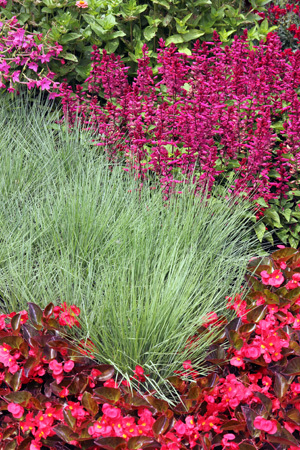 Ruby grass is a good addition to borders, mixed beds and can be used in containers. It combines well with many common annuals, or with other grasses. Use it in groups or singly as a textural contrast with broadleaved plants. 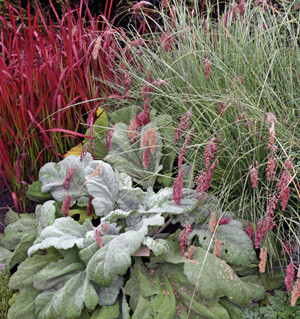 Position it near plants with reddish foliage – such as many varieties of coleus – or pink flowers for a color echo once the panicles emerge. It is particularly effective when planted in wide swathes and fits nicely in rock gardens. Ruby grass (upper right) with Japanese blood grass (L) and silver sage. Plant ruby grass in full sun in any well-drained soil. It is a warm season grass that performs best in hot conditions. 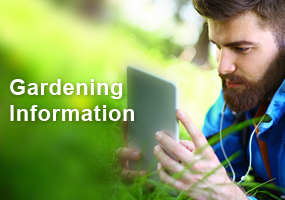 Although it is somewhat drought tolerant, it will perform better with consistent moisture. 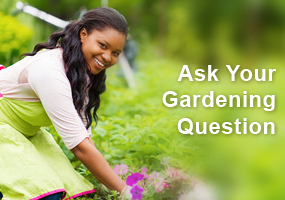 It is easily grown from seed and may reseed in some areas to the point of being invasive. 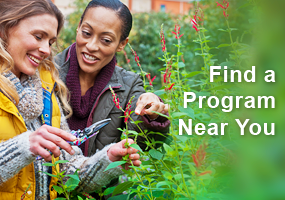 It grows fast enough to use as an annual even in colder climates. It should be started indoors 6-8 weeks before the average last frost in those areas for best results, but can be sown directly in the garden after the last frost. 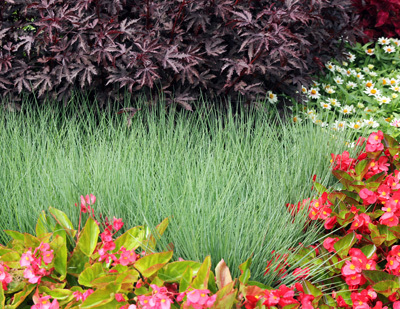 The blue-green foliage of ruby grass stands out against colorful flowers. Clumps can be dug in the fall before the first frost and potted up to overwinter. ‘Pink Champagne’ has lighter pink flowers. Pink Crystals™ grows 20-24 inches tall. ‘Savannah’ is shorter than the species, growing only a foot tall with darker pink to mauve flowers. I live in zone 7 that getting another snow storm. The ” Savannah Ruby ” Melinis Nerviglumis is brown and limp. Will it come back on it’s own ? Should I cut it close to the ground ? I live in zone 4, so this is an annual where I live. Wish I could plant it as a perennial. Love the pink color.